Ruins near the Union Depot and Hotel, Pittsburgh, PA, 1877. "Situation in Pittsburg is becoming dangerous. Troops are in sympathy, in some instances, with the strikers. Can you rely on yours?" James Beaver, National Guard of Pennsylvania, July 20, 1877. "We will have bread or blood. We will wade up to our waists in blood before we leave." Strikers in Pittsburgh taunting National Guard troops, July, 1877. As darkness fell over the city of Pittsburgh on July 21, 1877, an enormous glow illuminated the sky. 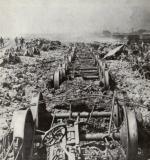 The Pennsylvania Railroad's (PRR) massive railroad yards were engulfed by a sea of fire. "Strong men halted with fear," one witness later recalled, "while others ran to and fro trampling upon the killed and wounded." The conflagration that raged that hot summer night was the result of a long-simmering crisis in the lives of American working men and women. The Great Railroad Strike of 1877 was the angry response of railroad workers to wage reductions, job cuts, and the profiteering by the huge railroad corporations that had risen to dominance after the Civil War. Millions of Americans had become wage workers when businesses boomed, but a bank panic partly sparked by the instability caused by railroads' rate wars in 1873 sent the nation into an economic tailspin. Railroads tightened their belts to ride out the rough times. They ran fewer trains, doubled up on work, laid off hundreds of crewmen, and -like many other industries at that time - cut wages. By the summer of 1877, at least three million Americans - an estimated 25 percent of the nation's workforce -were searching for employment. That May, the Pennsylvania Railroad had imposed its second 10 percent wage cut in two years. A few weeks later, the Baltimore and Ohio Railroad (B&O) announced ten percent pay cuts for workers making more than a dollar a day-including comparable cuts for officials-and at about the same time announced payment of a 10 percent dividend. For B&O workers, this was too much-it was the second 10 percent wage cut in a year. On July 16, frustrated workers and sympathizers blocked the movement of B&O trains in Baltimore, Maryland, and one hundred miles west, in Martinsburg, West Virginia. Word of the strike action spread quickly. Workers in Philadelphia, Reading, Scranton, Wilkes-Barre, Columbia, Harrisburg, Altoona, Johnstown, Derry, Washington, Erie, and Pittsburgh halted all commercial train traffic. Strike organizers in Pittsburgh struggled to maintain order. Union leader and brakeman Robert Ammon held rallies to explain the strikers' goals to the broader public. Both PRR President Thomas A. Scott and Pittsburgh Division Superintendent Robert Pitcairn demanded military protection of railroad property. 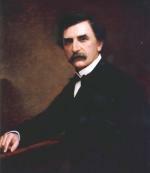 While Pennsylvania Governor John F. Hartranft made his way back from Wyoming, Scott petitioned the federal government by personally appealing to President Rutherford B. Hayes. In response to Scott, a critical supporter in his election, the President ordered strikers to disperse within twenty-four hours. Pittsburgh city police and local units of the National Guard of Pennsylvania sympathized with the strikers and refused to act against them. At Scott's urging, Hartranft then directed other National Guard troops from Philadelphia - presumably non-sympathetic - to Pittsburgh, intending to offer the strikers what Scott called "a rifle diet for a few days." Angry crowds of men, women, and children greeted the troops with taunts and boos as they advanced with lowered bayonets. Some of the troops were trapped in PRR's roundhouse, to which the mob set fire, and the soldiers shot their way to safety. Roundhouse in ruins, Pittsburgh, 1877. They fired into the crowd, killing twenty, including one woman and three children, and wounding many more. "The sight presented after the soldiers ceased firing was sickening" the New York Herald reported, and the area "was actually dotted with the dead and dying." Outraged at the killings, workers from nearby iron mills and other industrial shops poured into the railroad yards. Armed and seething, they took over the yards and, throughout the nights of July 21 and 22, exchanged sporadic gunfire with soldiers. The crowd burned or damaged 39 buildings, including the Union Station, as well as 104 locomotives, 46 passenger cars, and 506 freight cars. Twenty more local residents and five guardsmen died in what the Pittsburgh Commercial Gazette called a "high carnival of smoke and flame and pillage, and riot run mad." The wildcat strike quickly spread to other cities. On July 23, National Guard troops shot and killed 10 strikers and civilians in Reading in what became known as the Reading Railroad Massacre. PRR's Altoona shops were closed. On July 28th, Governor Hartranft finally arrived in Pittsburgh with an even greater show of force. Having already called out every National Guard regiment in the state, he now brought fresh and rested Philadelphia militiamen. In addition, he had control of a complement of seven hundred regular U.S. troops-fourteen artillery companies and two infantry companies, which had been delayed by a mob at Johnstown that had attempted to derail their train. Backed by the force of 3,700 troops, the railroads were back in business within two days. Railroad officials met with strikers, and Scott agreed to negotiate all grievances. 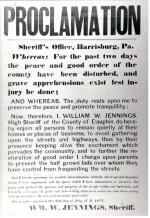 Few rioters were arrested or prosecuted and the railroad's annual report for 1877 cited the extent of damage and noted PRR's intent to sue Allegheny County for restitution. "It is hoped that the present depression will soon end and that with improved results a higher rate of compensation can be paid to your employees," the report noted. With slack business and PRR's $1.6 million settlement in a strike-related suit with Allegheny County, the company still declared a profit of $2.3 million for the year. By contrast, B&O made no mention at all of labor trouble in its 1877 annual report. Strike actions continued across the nation. In Chicago and St. Louis, trains stopped running and thousands of workers from other industries joined in general strikes. Soldiers were called out. And in those cities, too, many more workers were killed and wounded. By August, the military responses to the Great Strike caused its collapse. "We were shot back to work," one rueful worker noted. That summer, over one hundred thousand workers had gone on strike, more than one hundred had been killed, and nearly one thousand were jailed. Although owners and managers regained the upper hand, the seeds of a new labor movement were sown on those hot Pennsylvania days and nights. In the decades that followed, industrial workers and their bosses would engage in prolonged, often violent struggles over the nature of America's free market economy. Robert W. Bruce, 1877: Year of Violence (Chicago, IL: Quadrangle Press), 1970. Herbert Gutman, ed., Who Built America? Working People and the Nation's Economy, Politics, Culture, and Society (New York: Pantheon Books), 1989. David O. Stowell, Streets, Railroads, and the Great Strike of 1877 (Chicago, IL: University of Chicago Press), 1999.